I am a complete noob to this hollow state technology. I am building this transmitter to learn more about it so I can have more fun on the AM window. Currently I have been running a homebuilt SDR and solid state amp that runs 50W peak and about 12 W carrier. Does ok, but lacks warmth hihi... You can see it on my QRZed page. I could easily grab a solid state amp but where is the fun there? Anyway, I am currently building a HT-4U transmitter I found out about that is described in Electric Radio issue #279. It uses Heising modulation and puts out around 6w of carrier. As I am building this I am already thinking of more power. The natural next step seems to be to a 6146B stage. I just acquired a 500-0-500 plate transformer that would fit the bill nicely, and I am comfortable with building the PS to deliver all of the voltages required by the tube. Since I am learning I thought it good to target the 300V supply for the transmitter and a 750V supply for the 6146 amp. Not ready to tackle KV rated supplies. What I am stumbling on is how to properly mate the final 6V6 to the 6146 stage without having to tune both finals every time I tune up. I see on the Globe Scout, that they tune the final 6146 with a load capacitor but on the input to the 6146 use a set of inductors on a band switch and a variable capacitor that must be calibrated once, as I see nothing on the front panel that would allow that stage to be tuned frequently. Is that the way to do it? Is there anyway else to couple the 2 stages together so that I do not have to treat them as two separate amps. I intend to eventually put all of this on one chassis. Right now I have it built up in separate units (PS, Audio Pre-amp, modulator, 6V6 final). I have nothing started on the 6146 portion. So, at this point I could even entertain a different final tube or tubes. Feel free to point me at the appropriate information if it exists. There seems to be so much info on this. Perhaps even suggest a issue of the radio handbook I can search for that has the appropriate theory behind this. I'd look at the D.r's website, particularly his Analysis of the Range's RF ckts. That should answer a lot of your questions. Wow. It was here all along. Buffer tune. What an excellent tutorial! When going for more power in your transmitter, try to make the difference at least 10 db. A value of 10db makes the received signal a couple of S units higher, +/- depending on S meter calibration. So if you now have 6 watts AM, add 10 db to that and you need 60 watts carrier. Also consider your maximum driving power which at 100% modulation is 4 X 6 watts, or 24 watts PEP. Your Heising modulated 6V6 might only do 20 watts PEP since Heising modulation has troubles getting to 100% modulation unless that ER article does some tricks. That 6146B amplifier only needs a fraction of a watt to drive, and you have around 20 watts PEP drive available. Then consider linear amplified AM is very inefficient. When loaded for full modulation capability, the efficiency is around 33%. What this works out to is the maximum AM carrier output is approximately 1/2 the final tube plate dissipation value. A 6146B has a CCS Pd rating of 27 watts and an ICAS rating of 35 watts. This means the maximum carrier out of your amplifier is 13.5w atts CCS or 17.5w ICAS. This means at the tube maximum ratings, all you can get is around 3.5 to 5 db gain....That is a lot of effort for less than 1 S unit at the other end. Another idea is a grounded grid 811a. There used to a a 200 watts input GG 811 linear in the ARRL handbooks back in the 1970's. Here somewhere around 15 watts PEP will make 150w PEP. Divide that by 4 and the carrier is at 37.5W. Then look at the 811a plate dissipation which is 45w CCS and 65w ICAS. This cuts you back to 22.5w CCS and 32.5w ICAS. You can use more of your drive, but even with a big 811a, your limited due to resting carrier plate dissipation. But you could try a GG 572B....That would do it, and you will get that 10DB and more. With the GG approach, there is no need for a bias supply, and no need for a screen supply. A low Q tuned cathode circuit does not need a front panel control. An 813 doing linear AM with forced air through a chimney can do 70 to 100 watts AM carrier with headroom for full 100% modulation. Thanks Jim for the sound advice. I looked at the 813 design and see big PS voltage. I was trying to avoid going to multiple KV of voltage since that brings in a whole new ballgame of better build techniques to avoid arcing, let alone the expanded costs for KV capable components. Seems like this AM gig is all in or go home. I was hoping to find some sort of approach that allows me to use this 1KV transformer I bought for a song, and build a credible amplifier around a voltage of 750 volts or with a full wave rectifier approach around 1350 volts. Going to 2+KV is something I am a bit leery about. You have given me some thing to chew upon. Thanks for the reply. I really appreciate it. Still learning. On the Noontime forum that I like to join on 7.295, with better bands, my little 12W of carrier gave signal reports of S9+ into most of the shacks. Now that we are at the bottom of the solar valley, I can't even hear the QRO stations most of the time, and they certainly can't hear me. I run a 135ft doublet balanced into a tuner so most of the time it works really well. Also read that it helps if you have a tank to tune. I figured that since we are at a null in the action, jumping into something completely different (toobs) would be interesting. You can only solder 0805 caps on a pcb for so long until you go completely mad! The imd would be on the high side, but a couple sweep tubes will make an easy 60 watts of carrier on 40 meters at 800 or so volts. If you don't have any, their are some nice ones in Russia. Or a gi7b will give nearly 100 watts of carrier for about 20 bucks. No socket, either. I am rethinking an 813 approach. Going to see what voltage and current I can get out of this plate transformer I have and then get back to this forum on whether it would be enough to drive a single 813. Comments in the thread suggest to start with a little PS then transplant a bigger one later. Interesting. I think I can get more than 1250V. Not sure about the current. Will 200ma be enough? I was also thinking that I could split the little transmitter and use the oscillator and final to drive the RF input and use the audio section with more amplification to drive a pair of modulation tubes and a modulation transformer. I would give up the Heising modulation after I am done playing with the little transmitter. I am building it on electrical boxes so it is easy to keep it modular and easy to split later. I am mounting all of the components from under so it would be trivial to transplant whole circuits into a different chassis later. If your little rig is giving you 6 or 7 watts of carrier, it will be just about perfect for driving a pair of push-pull 809's. With 600 VDC on the plates, you will get around 70 to 80 watts of carrier. Do not use Heising modulaion! Use shunt feed modulation as describe by Genaille. This is true plate modulation, though some call it modified Heising. You may find a schematic in RCA Ham Tips. This thing will neutralize easily, and give pleny of power on 10 meters. Another good option might be a single 4D32. Good tube. Look for a 32V3 schematic, and used the same plate voltage and screen resistor. Or consult the 4D32 data sheet. 4D32 FB with 600 to 650 VDC. Some go up as high as 900, but probably not necessary. Appreciate the pointers, Matt. Doing a lot of studying. I like the 809 idea but don't find much that folks have done recently with the RCA tech notes. I note that RFParts has the 4D32 and they sell it at about 1/2 of the price of the 6146B. Interesting. Most articles claim that the 4D32 is hard to find and expensive. I have a bid active on a 6.3 filament transformer at 10A. If that goes thru, I will go build the PS and see how that proceeds. In the mean time I will study the Collins schematic to see how I would go build it. Fair Radio sales is selling the 4D32 for about 25 bucks! Also, plenty of NOS 809's may be found on Epay. Do you want unbalanced 50 output, or balanced output? If you want unbalanced, I would lean towards the 4D32. If you want balanced output for ladder line and symmetric antennas, I would lean towards a pair of 809's in push-pull. Do not wire the 809's single ended. If you do, neutralization will be a real problem above about 15 or 16 Mhz. In a push-pull circuit, they will neutralize easily. If you want to try Screen Modulation here is a circuit using a single Sweep Tube in the final that can produce 35W AM and 50W CW. It is a "Turbo-ized" version of the Hallicrafter's HT-40. Been looking at this transmitter from K9ACT...Fits my desire to run the B+ at around 1KV and is pretty straightforward on components. Trying to determine specs needed on mod transformer. On RF driver, plate voltage divided by current (based on data sheet) gives me around 7500 ohms for the secondary? For the primary am I to assume 1/2 that since it is running push pull? Max wattage is around 200W, so should I be looking at a transformer that can handle at least 100W and have a voltage rating of 2.5KV? (2x expected voltage of 1300V). Should I consider a shunt transformer on the secondary to keep the KV rating lower on the mod transformer? Dayton Audio makes a low distortion 150 watt amp, and it is not expensive. It has 8 ohm and 4 ohm outputs. This thing has enough audio for 2 809's, a 4D32, or even a pair of 4D32.....or a pair of 812A's. You will need a Hammond audio transformer with the desired secondary impedance. You will also need a reactor choke in the 8 to 12 Henry range, rated for some decent voltage, and rated for enough current. Finally, a 4 uF oil capacitor rated for about 4 kV. You might want 6 kV for 812A's, but 4 kV might work in that situation. Put these things together as a shunt feed modulator as per Genaille. A humble cake pan will do for a chassis. The nice thing is that the Hammond audio transformer need only be rated for about 70 or 80 watts for a pair of 812A's! That is because the transformer secondary carries audio current only, and not DC plate current! The choke does all the heavy lifting on DC plate current. For the 809 pair, a 35 watt audio transformer will be plenty......even 25 watts would work. Put the HV supply on a variac. That way, you can vary the HV some, and get the V/mA to match your audio transformer secondary. Do not forget a microphone amp +/_ mixer box for the Dayton amp. 1. Found a Stancor 125 W mod transformer - 3894. I think this will work, right? Or should I hold out for a SS22 or 3898 or equiv. With the Reactor choke will I be able to go to two 811's if I want to later? 2. Reactor Chokes are expensive and hard to find...suggestions? 3. Found a 4uf 4kv oil filled cap - is $60 too much to spend or should I wait for hamfests to find one? Not many good ones here until summer. 4. Will a 100K 200W Ohmite wire wound resistor be ok for the bleeder? I tend to avoid wirewound, but probably nothing else will be available at this wattage. Surplus sales has them for $20. 5. I have 10 1N5408 diodes. Is 2 diodes per side on the bridge sufficient? That give me 2KV at 3A. My plate trans is 500-0-500 secondary. 6. Have not tried to locate a variac yet. Suggestions on good sources? So much to learn. Having fun though. Will this work for the audio transformer? Or is the 450V rating too low? I don't see any large voltage on the grid if I am reading this right. I took Jack's schematic and annotated it with component names to help me build a bom. On the other end of this project, I have a transmitter. It has a preamplifier using a 6SN7 preamp and a 6V6 buffer that drives the RF chain using heising modulation. I plan to break it here and use the audio chain and RF chain separately. 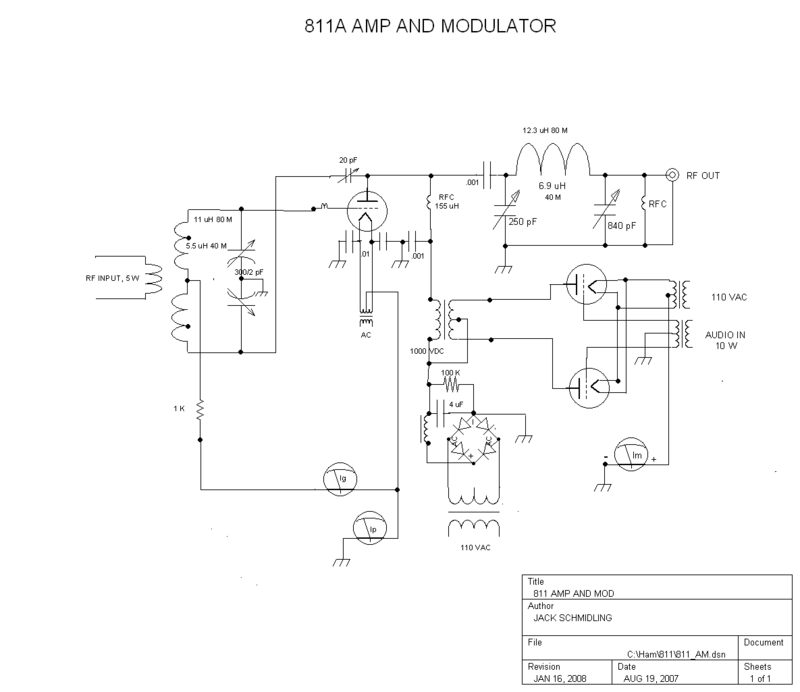 Thinking about the modulator, why would I need to have a 8 ohm audio transformer if I am going to drive it with a tube audio amp. Could I just not use some sort of matching transformer to match the unbalanced output of the 6V6 into a centertapped secondary to drive the grids of the 811s? I am going to go off and take a look at some old transmitter designs to see how to do this but thought I'd post it here as well to articulate my thinking here. Yes, 2 811's should be OK with shunt fee modulation. If you want some higher power triodes for RF, use an 812A pair. I would confine the 811A's to modulator service. 60 buck not too bad for caps. However, you might find a lower price if you are patient. Forget the Hammond if you want a tube modulator. Thanks Mathew, Appreciate the frequent help. Yes, have been considering a different RF tube. Jack used an 810 there with good results. Different filament voltage, however. Here is a snip of the valiant schematic. This is what I was trying to describe. Don't know if the 6V6 will be enough, may need to add another stage like this pic. Will know when I have the transmitter built. Finally have all the parts to build the audio chain. Still waiting on the plate transformer to arrive. Here is the Genaille paper if you have not seen it. This approach works with either tube type modulation transformers, or "backwards" Hi-Fi transformers and solid state amps. Sheza on your C drive.... ..